A brown recluse spider bite is one of the most feared spider bites in the United States, and with good reason. 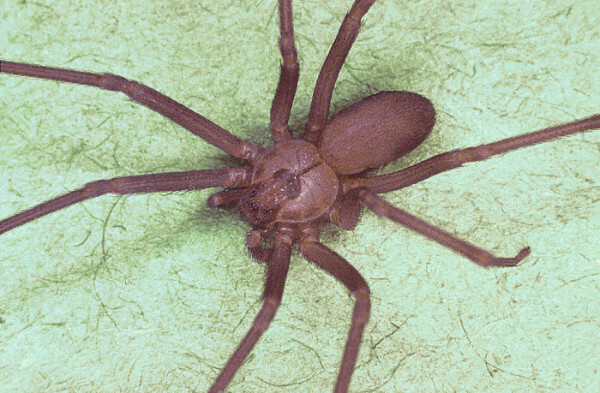 The brown recluse spider is one of the most harmful spiders to humans. Most spider bites have little effect on humans besides itchiness and irritation, but brown recluse bites can cause tissue damage that lasts for several months and may even require surgery. It is important to be able to recognize the brown recluse spider bite and to know how to handle the symptoms. A brown recluse spider is typically light colored, ranging from tan to soft brown but can also be very dark brown. This spider is characterized by a violin-shaped marking on the abdomen and is often referred to as a fiddleback spider. The violin pattern is darker than the rest of the body. However, identifying the fiddle or violin shape is not always easy. The best way to identify a brown recluse spider is by the arrangement if its eyes. It has six eyes which are arranged in groups of two across its head. A brown recluse spider bite is easy to identify, even if you did do not see the spider which has bittenactually bite you. Oftentimes, theThe brown recluse spider is not seen often because it is indeed reclusive, hence its name. It will only bite if it feels threatened or thinks that it must protect itself. Appearance of the bite The site where the brown recluse has bitten the victim will turn red and will develop a blister (a fluid filled raised area of the skin) which looks whitish. After the blister bursts, the site and the area will become larger and develop into an ulcer that will also damage surrounding tissues. The ulcer will develop an eschar or scab and may last for a few months and require surgery to slough off. The site where the hobo spider has bitten the victim will often resemble the appearance and symptoms of the brown recluse spider bite but more often, the bite of the hobo spider starts as a small insensitive or numb area which is surrounded by a big large red circle which can be a few inches in diameter. A blister appears within 48 hours and, after the blister breaks, a scab will form and tissue destruction will continue under the scab but will not be as severe as that of the brown recluse spider bite. Key Symptoms Mild sting which can progress to pain in a matter of hours, often within 8 hours. Itchiness may also be present. Besides this, brown recluse bite symptoms may also include mild or low fever, nausea, chills, restlessness, vomiting and rashes with muscle ache. Muscle pain and muscle ache with some numbness surrounding the area of the bite. Itchiness and a stinging sensation can may be present. For the elderly and the very young, or people who are highly sensitive to spider venom, the brown recluse spider bite can be fatal if left untreated. Complications such as local wound infection and further tissue damage may occur and should be monitored. Antivenin is available but should be given early to prevent the progression of the symptoms. Although the hobo spider bite is non-fatal, the bite can still get infected and therefore it is best to seek medical attention as soon as the bite is identified. Read our article about the hobo spider for more information about this creature and its bite. People often get confused between the bites of the hobo and the brown recluse because they have a lot of similarities. This is why it is important that the spider bite is identified properly to know the next actions to take. After identifying brown recluse bite symptoms, immediate first aid and treatment must follow. The following are the steps to take. 1. Wash the wound area and apply an ointment with antibiotic properties. 2. Place a cold or cool towel over the bite to minimize swelling and spread of the venom. 3. Raise the part of the body with the bite to slow down the spread of the venom. 4. Medications such as acetaminophen and ibuprofen can be given for the pain, if required. 5. Contact your doctor for possible brown recluse antivenin administration. 6. Monitor the progress of symptoms. 7. If an infection or any of the following develops, seek medical attention immediately: an ulcer that does not heal, nausea and vomiting, fever and rash. 8. If the brown recluse spider bite produces an eschar or scab that does not heal or has been present for months, surgical intervention might be needed, as well as monitoring for infection, which can be very serious. A brown recluse spider bite should be taken seriously, especially if the bitten person is a young child, an elderly person, or a person with a weakened immune system. Although brown recluse bites are relatively rare and many bites suspected of being from this spider are actually mis-identified bites from other spiders, it is better to be safe than sorry. Arming yourself with the knowledge of how to identify and treat a brown recluse bite is the best way to protect yourself and loved ones from a brown recluse spider bite.